Canadian Maple Leaf is a remarkably popular series issued by the Royal Canadian Mint and are legal tender in Canada. 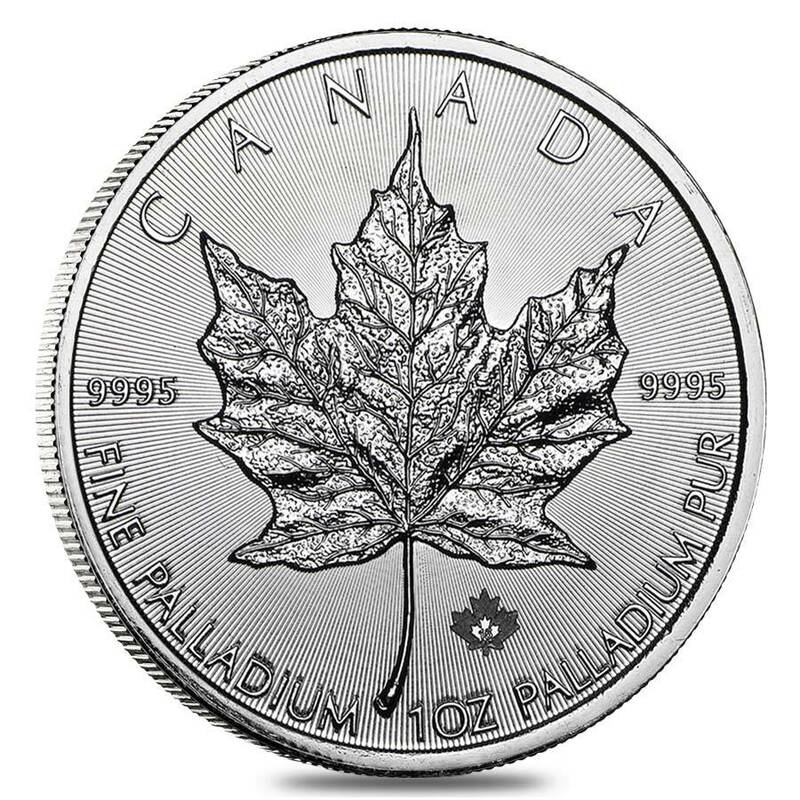 One of their recent series that was introduced only in 2005 is the Palladium Maple Leaf. This is the only legal tender palladium bullion coin that is available in the world! Face value of $50 (CAD). Legal tender issue of Government of Canada. Individual coins are sealed in plastic in strips of ten coins. 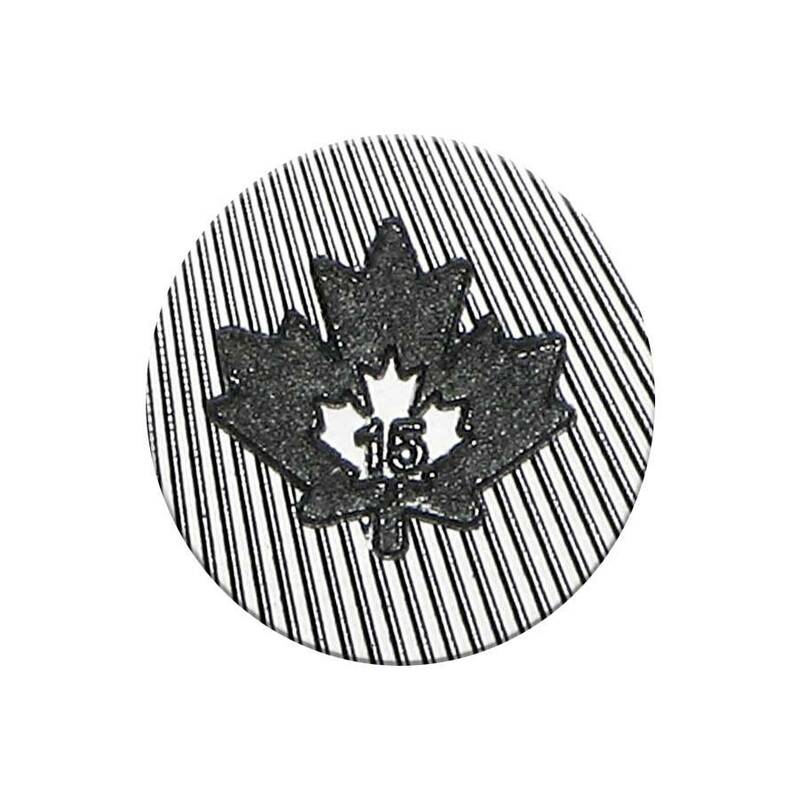 Reverse: Depicts an intricately detailed image of single Maple Leaf. Inscriptions - “CANADA,” on top of coin “FINE PALLADIUM” and “1 OZ PALLADIUM PUR” at the bottom, and fineness “9995” on either side of the Maple Leaf. Security Feature: Precisely machined radial line background emerging from the center of the coin gives an exceptional characteristic look to the coin and creates a unique light diffracting pattern. A small textured maple leaf is micro engraved on the reverse with the year of mintage on it. Content, weight, and purity backed by the Royal Canadian Mint. 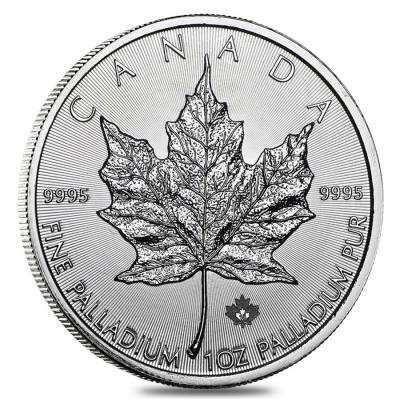 Why buy the Palladium Canadian Maple Leaf Coin? The Palladium Canadian Maple Leaf coins are not minted every year due to their rare availability. They are the only legal tender palladium coins available in the world. The 2015 coins have great security features and is impossible to counterfeit. The inherent value of the coin is much higher than its face value of $50. The Canadian Palladium Coin has the iconic maple leaf design on the reverse which is recognized worldwide and hence easy to buy and sell. Palladium is an important precious metal and hence allows you to diversify and stabilize your investment portfolio. Canadian Maple Leaf series is a world renowned series and offer bullion coins in gold, silver, and platinum. 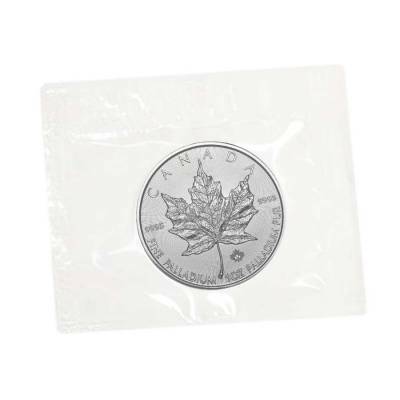 In 2005, the Royal Canadian Mint, introduced a 1 oz .9995 pure Palladium Maple Leaf coin. The Palladium Maple Leaf is the only known legal tender coin backed by a government that is available for investment. However, the offering of these coins have been very limited and rare compared to other precious metal Maple Leafs because, palladium is a rare metal which and its occurrence is 15 times lesser than platinum and about 30 times lesser than gold. Moreover a majority of the palladium comes from only two places which are South Africa and Russia, this makes it difficult for the mints to have a store of palladium. Due to this problem, these coins have been minted only five times so far; 2005, 2006, 2007, 2009 and 2015. These coins are made of 1 oz 99.95% pure palladium and the latest issue, the 2015 coins have some impressive security features like the precisely machined radial line background emerging from the center of the coin gives an exceptional characteristic look to the coin and creates a unique light diffracting pattern. 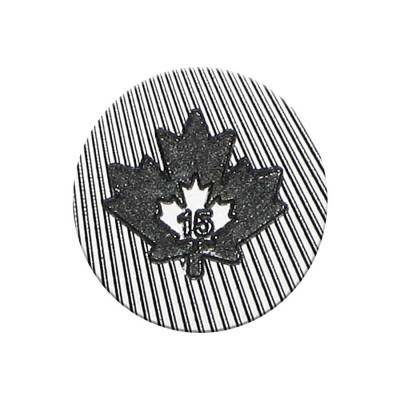 Another visual security feature is micro engraved textured maple leaf on the reverse that has the last two numerals of the year of mintage which is done using laser technology. 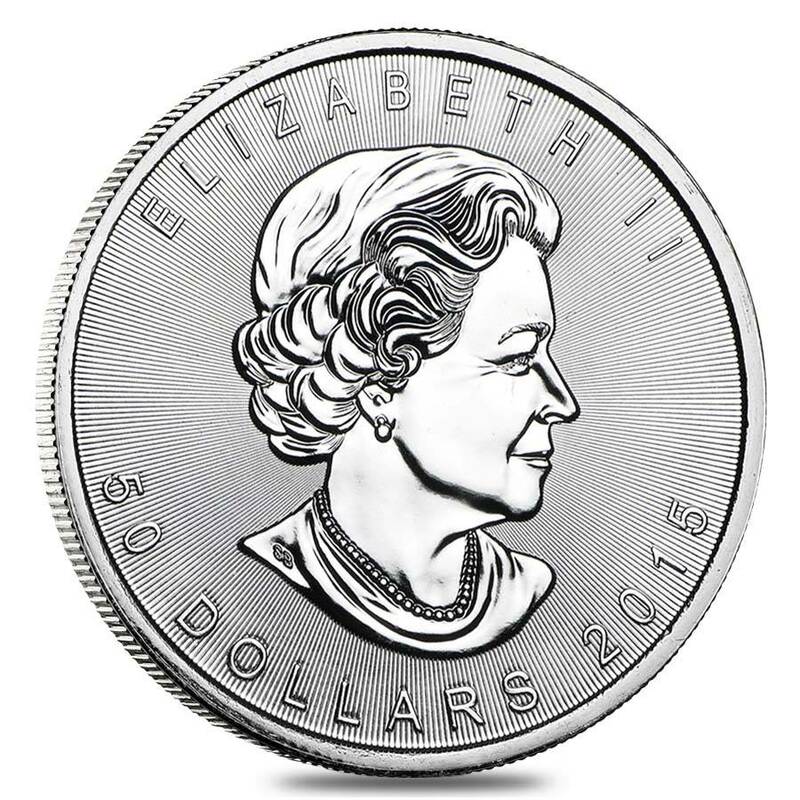 The obverse is graced by a Susan Blunt designed portrait of Her Majesty Queen Elizabeth II and the reverse features the iconic single Maple Leaf design. The coin has a face value of Canadian Dollar 50, however, its intrinsic value is much higher than that. Palladium is also an important precious metal that is mainly used in the automobile industry for making the catalytic converters used in auto emission controls. Apart from that, the metal is used in jewelry, dentistry, electronics, and chemical industry. These coins have lower premiums compared to Credit Suisse and PAMP Suisse bars making them a great way to diversify your portfolio. 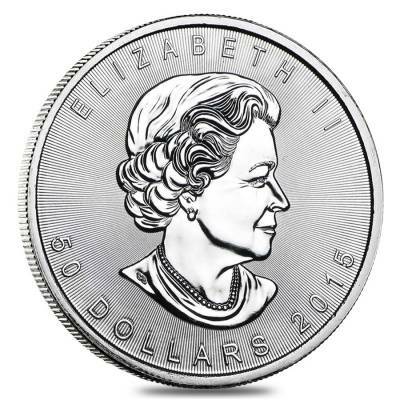 Bullion Exchanges is pleased to offer the 2015 1 oz Palladium Canadian Maple Leaf Coin BU at one of the most competitive prices in the industry. Browse our collection of Palladium Coins and bars. Feel free to contact us at 800-852-6884 if you have any questions in regards to any of our products. unique palladium coin! I adore it! great packaging and fast shipping, as usual. Thansk BE! My 2015 1 oz Palladium Canadian Maple Leaf Coin was sent to my uncles house just in time for his birthday! I am happy to have selected Bullion Exchanges they helped me place my order over the phone and sent my package free of shipping. For every $1 spend, you will earn 1 Bullionaire Buck which is equivalent to $0.001 off a future purchase. 1484 BB = $1.48.